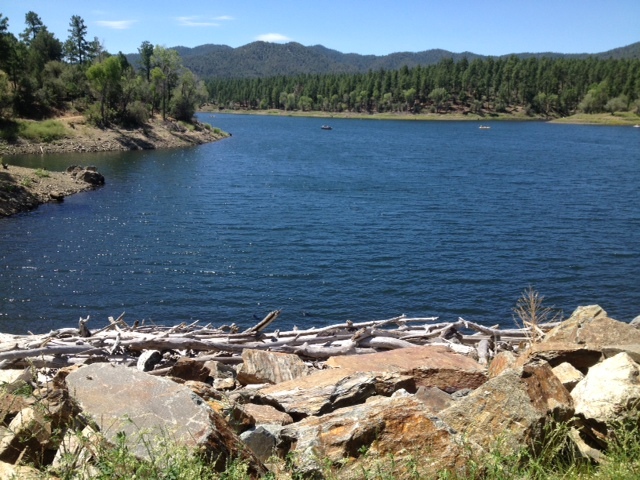 Steve and I went to Prescott, Arizona, with my sister and her husband for two days of recreation and fun. We met up with them at Cuppers, a coffee shop tucked in the heart of town, that serves the most interesting and delectable coffee and tea drinks imaginable. By the time we reached the hotel to check in for early arrival, we’d already hiked around Lynx Lake and had a meal at the Lynx Lake Cafe. My hubby ate potato pancakes and fried zucchini until he could eat no more, and there was some of each still left on his plate. The cafe is not much to look at from the outside, but the food was fabulous, as was the view of the lake outside the window. There were very few, if any, unoccupied tables while we were there. We spent the latter part of our first day at Jersey Lilly’s. We danced while the band played, and the vocalist sang oldies but goodies rock from the 60’s. The continuous merriment kept us there celebrating until midnight closing! Steve and I fell into our hotel bed exhausted but happy from a day of pleasure, in the company of my sister and brother-in-law, in the little town of Prescott, Arizona. This entry was posted in Memoir and tagged 60's rock, Ambiance, Arizona, Band, Breweries, Cafe, Cafes, Calories, Coffee House, Coffee Houses, Coffee Shop, cold press, cold press brew, Cold press brewer, cold pressed, Crowd, Dancing, Early Arrival, Early Check in, Fried Zucchini, Fun, Hiked, Hiking, Historical, History, Hotel, iced coffee, Less acidic coffee, Lynx Lake, Lynx Lake Cafe, Merriment, Mexican Mocha, Midnight, Oldies but goodies rock, Personality, Pleasure, Potato Pancakes, Preheated Coffee Mug, Preheated Cup, Preheated Mug, Prescott, Prescott AZ, Quaint Shops, recreation, Refreshed, Refreshing, Relaxation, Relaxed, Restaurants, Shops, Vocalist, Walking, Walking Briskly. Bookmark the permalink. This sounds like a wonderful little getaway. I think of all the days you spent in your little apartment in TX, it’s good to see you out there living life with gusto.